General Secretary of the Communist Party of Vietnam Nguyen Phu Trong waves when he arrived at Andrews Air Force Base in Washington D.C., the United States, at 8:00 am on July 6 (local time), for a five-day visit. 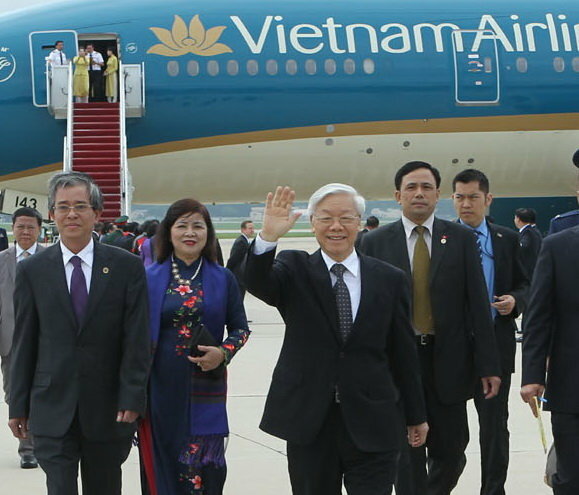 General Secretary of the Communist Party of Vietnam Nguyen Phu Trong has arrived in Washington D.C. for a five-day visit, and he is scheduled to meet with U.S. President Barack Obama today, July 7 (Vietnam time). Representatives of the U.S. government, Vietnamese Ambassador Pham Quang Vinh, diplomats from ASEAN countries and many Vietnamese people in the U.S. welcomed General Secretary Trong and his delegation at Andrews Air Force Base in Washington D.C. at 8:00 am on July 6 (local time), according to the Vietnam News Agency. The visit, which is the first-ever by a general secretary of the Communist Party of Vietnam, has been planned at the invitation of the Obama administration. The visit takes place at a time when the two countries are marking the 20th anniversary of the restoration of diplomatic ties, and two years after Vietnam and the U.S. established a comprehensive partnership. During the visit, General Secretary Trong and his hosts will discuss measures to strengthen their bilateral relations and deepen the Vietnam-U.S. comprehensive partnership, with a focus on investment, trade expansion and facilitation, education, training, science, technology and defense and security. The general secretary is scheduled to meet President Obama at the White House today, and their talks is expected to last for 45-60 minutes, said Tran Dac Loi, deputy head of the Communist Party of Vietnam Commission for External Relations. After the talks, the two sides will issue a joint statement and witness the signing of a number of cooperation agreements. The Vietnamese Party leader will also deliver a short speech to the press. During the day, General Secretary Trong and his delegation will also visit the Thomas Jefferson Memorial, which is a memorial to late U.S. President Thomas Jefferson. The delegation will also attend the handover of a Boeing 787-9 Dreamliner from Boeing to Vietnamese flag carrier Vietnam Airlines. This is the first of 19 such planes the Vietnamese airline has ordered for purchase and hire from Boeing. Later the same day, the guests will attend a banquet hosted by U.S. Secretary of State John Kerry. The Vietnamese Party chief will also meet UN Secretary-General Ban Ki-moon, Senator John McCain and a number of politicians from both the U.S. Upper and Lower Houses. He will also speak at the Center for Strategic and International Studies about “The Vietnam-U.S. Relations in a Changing World,” and join a workshop with American entrepreneurs. The annual Nguyen Hue Flower Street, now in its 15th year, began welcoming visitors after the opening ceremony on Tuesday night.